We joked about it for months. Open season on riceboys. 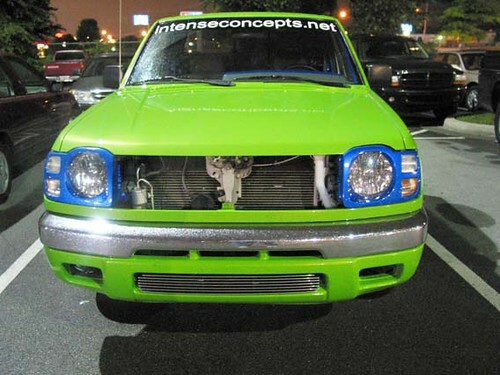 If we wanted to find a ricer, we knew where to look: no further than opening night of "2 Fast 2 Furious." It stood to reason that the kind of person who would see that movie on opening night would also be the kind of person who got their jollies showing off their car in the parking lot for everyone else who had nothing better to do than to obsess over the vehiculage of others. In other words, I could get all the laughs and snaps I wanted, without even having to buy a movie ticket. All it required was a drive down the Parkway and an empty memory card in my camera. Or, as they'd say back home, easy pickin's. I understand that the cool thing right now is to have The Car That Reflects Your Personality, and I have only one thing to say: If you need that kind of validation, get a dog. Seriously. They're a hell of a lot cheaper, and chicks are gonna dig a perky mutt with big pet-me eyes far more than they're gonna dig your incessant bloody prattling about how your clear aftermarket taillights are 50% cooler than stock.For the love of God, get over yourselves already so we don't have to waste perfectly good ammunition on you. The rest of the world simply can't find enough words to express how little we care. Besides, I can guarantee you that any satisfaction you derive in navigating from one red light to another one second faster than my nimble little Jetta is thoroughly outweighed by my satisfaction in paying only $350 every six months for car insurance. One of the easiest ways to avoid causing trouble in a potentially-troublesome situation is to make nice with the security. Since I was walking around by myself in a parking lot that was being watched over by security, I wandered over and introduced myself to the theatre security folks and explained what I was doing. I showed them the photos I'd already taken. They were amused, but at first misunderstood my purpose. "So, you wanting to trick out a car like that?" "Nope. I've got a mortgage. I've got far better things I could be spending my money on." I looked up, and the nods turned to smiles. I'd won, and I knew it. "I'm just going to wander around and take photos of some of the cars and then head on home. Mostly I just wanted to let you know what I was doing before you started wondering why I was crisscrossing the parking lot." "Appreciate it. Have a good evening!" I walked back to the cars. Oh, the silliness abounded. This was apparently the place to See And Be Seen; remember, you don't get your recommended daily allowance of narcissism (that's vitamin B-81 for you health nuts) if you aren't spotted while looking around. I took pictures of a lot of cars. I'm not going to bore you with most of them, but I will torture you with one. Just one. I have my reasons, trust me. Then there's the blue. My mind just doesn't know how to deal with the blue. There's a reason for that blue, I'm sure, but the only comparison that comes to mind is the fourth-grader finding her mother's blue eyeshadow for the first time and going to town, thinking that more is better. I walked around to the side. Ah, yeah, there's more blue. 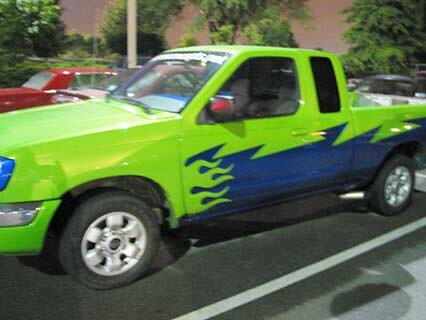 Just what this truck needs, more than one eye-screeching color to make the impression complete. 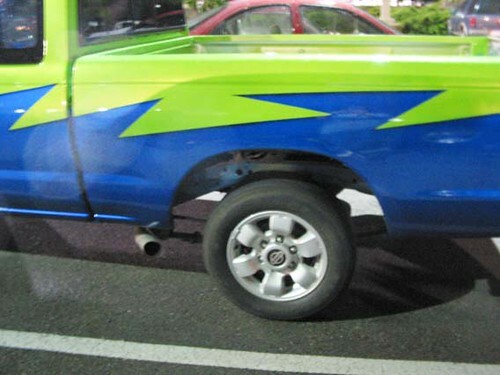 Yep, the owner of this truck Has Personality - or, at least, a paintjob. I almost kept walking, and then I looked a little closer. The only question that came to mind: "Does this truck fart so much that one fartpipe just isn't enough?" I rather like my other theory, about oversized in-dash drinking straws, but after running that by a few random netfriends, no one seems to find it as funny as I do, so I'll spare you. I don't pretend to know if it's stock or not, but either way, it looks pretty dumb. Then I walked around to the back, where I stood in abject horror. Yep. Winner. All the other cars in the lot could just go home, because this was the vehicle that was getting a rice-rice-baby post. LoL! I drove by the movie theatre a few weeks ago and there were about 25 cars all lined up with a bunch of teen-aged/early 20's boys googling over them like a bunch of school girls. Hilarious! Oh my living... What the hell is that last picture? 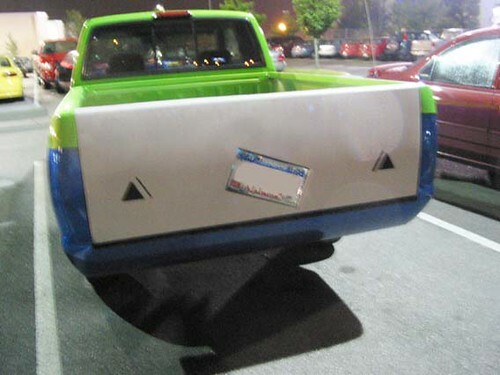 I mean... an askew license plate and triangles?! WTF? When a bad concept goes even worse. HOLY FRIGGIN' CRAP! That's the ugliest thing I've ever seen! As for Lanti's comment, there's nothing wrong with modding a Civic, as long as you know that without a lot of cash, it won't be fast. 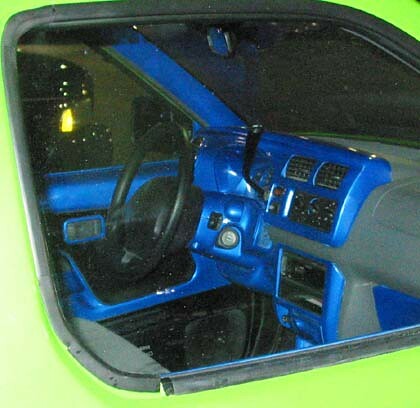 Go check out 7thgencivic.com, there are some REALLY nice cars there, and unless you're looking for a flame war, sign up on the forums and chat a while.